While harvest has started early for much of the nation, farmers often tell us that a big challenge during this crucial time of year is deciding when their fields are dry enough and ready to work. As the focus on weather intensifies, farmers who use Climate FieldView™ often ask why our field-level estimates may differ from a rain gauge located on, or near, a field. Last year, we explored how our estimates are created, how to interpret them, and how we have improved them recently. As part of our work on the Climate Weather Science team, we study how rainfall can vary a lot across a single field or an entire operation. This variability is why FieldView™ rainfall reports provide an average estimate of rainfall over a field – these rainfall estimates at the field level can be more valuable for decision-making than individual rain gauge observations. Rainfall can vary significantly at the field level for many reasons. For example, small storms, and small-scale features in larger storms, can produce very different rainfall amounts over short distances. To better understand rainfall variability across a field, we deployed nine high-quality rain gauges on a field at our Climate Research Farm in Martinsville, Ill. – and what we discovered was very surprising! When a half inch or more of rain fell, the average difference between the highest and lowest rainfall observations was over 0.2 inches, which is much higher than we anticipated. Below are three separate 24-hour rainfall totals for the nine rain gauges at Martinsville. For event A, rainfall varied from 0.76 inches to 1.33 inches across the field! A single rain gauge measurement could have greatly overestimated or underestimated the average rainfall that fell on this field, possibly leading to a problematic field management decision. While it is unrealistic to expect you to place and check nine or more rain gauges in each of your fields, the good news is this is not necessary. FieldView rainfall estimates represent an average for a field, and our model takes variability into account so you will get a more representative read of the rainfall in your field. This is also why our FieldView estimates may be different from a single rain gauge on a field, and why that can actually be a good thing. Three sets of 24-hour rainfall totals measured by rain gauges on a test field in Martinsville, Ill. Rain gauge measurements varied from 0.76 inches to 1.33 inches for event A. Now we know that rainfall can vary significantly even across a single field, but how different is rainfall across neighboring fields? To answer this question, we selected all rain gauges within a 10-mile radius near Des Moines, Iowa and analyzed the observed rainfall in comparison to FieldView rainfall estimates. Below is one example of 24-hour rainfall observations at 14 gauges in this region, along with gridded FieldView estimates. Rain gauge observations varied between 0.5 and 2.25 inches over only 10.5 miles! FieldView rainfall estimates showed even more variation from 0.4 to 2.6 inches because FieldView provides additional detail in areas without rain gauges. This analysis shows that there can be extraordinary and impactful differences in rainfall from one field to another across an entire farming operation. FieldView rainfall estimates better represent these important field-to-field differences even compared to data from multiple rain gauges. 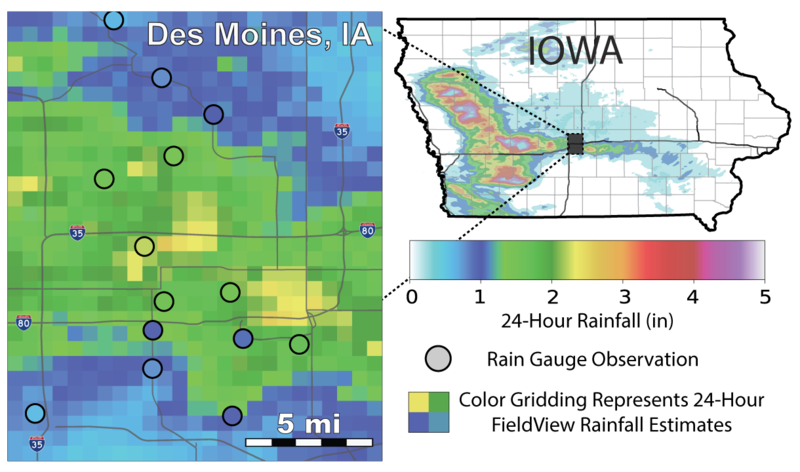 Gridded FieldView rainfall estimates and corresponding rain gauge observations for a 24-hour period near Des Moines, Iowa. Rainfall varied by almost two inches over very short distances. We invite you to use FieldView weather features to help you get the most out of every acre during harvest season – and throughout the year. If you have any questions, feel free to contact the Climate Support Team at (888) 924-7475 or support@climate.com. Jeff Massey is the weather science lead for The Climate Corporation. 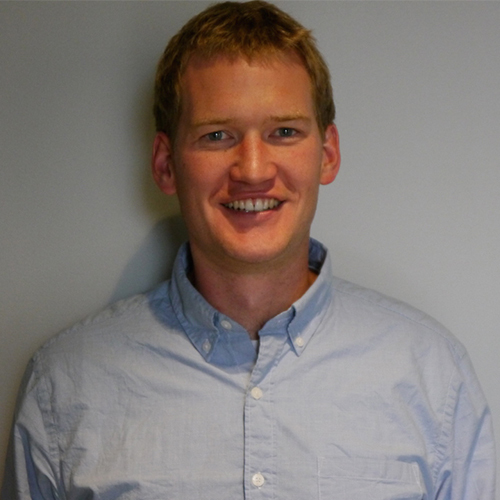 He has a Ph.D. in atmospheric science and has been with Climate for more than three years, focusing on delivering agronomically relevant weather information to farmers across the nation. 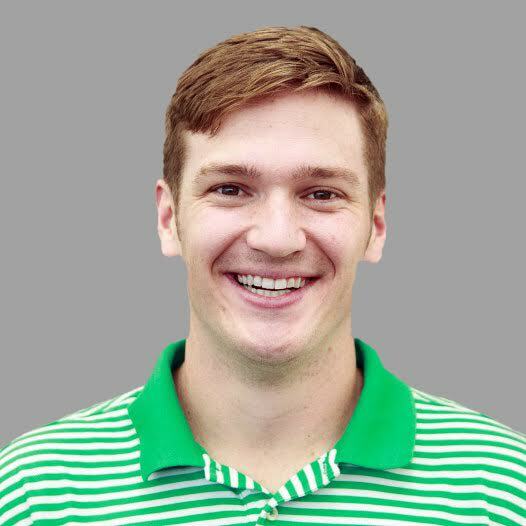 Zach Wienhoff is an agricultural meteorologist intern on the weather team with an expertise in rainfall processes. He is currently working towards his Ph.D. in meteorology at the University of Oklahoma with a focus in severe thunderstorm and tornado dynamics.